The 1990s will be remembered as an era of prodigious expansion in world trade. Suddenly--for reasons encompassing irresistible new on-line technology, a vastly greater geographic reach, and sheer volume of goods and services--the old intellectual property (IP) laws and protocols long respected by international business became woefully inadequate. 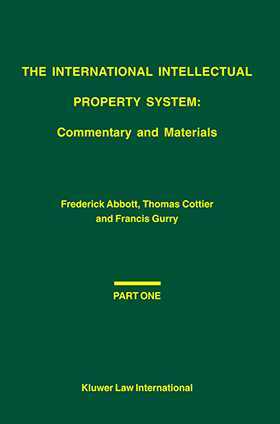 As a result, this masterful one-volume introduction to the new global regime of IP law fills an urgent need. Immediately recognized as the landmark work in its field, The International Intellectual Property System gives business lawyers everywhere the organized materials and expert commentary they need to protect IP rights on a global scale--and provides law students with an authoritative annotated survey of the relevant conventions, treaties, and laws both regional and national, as well as significant court interpretations in various jurisdictions.